ISG signs CDA with Public Health England, Department of Health under HM Government. In Silico Genesis signed up a Confidential Disclosure Agreement with Public Health England (PHE), previously Health Protection Agency, in June 2013. This CDA was reaffirming an initial CDA placed in October, 2011 between Health Protection Agency (HPA) and In Silico Genesis (ISG) about the antiviral work in collaboration. A closer look at how the digital images are generated. Upon clicking the link above, you should be able either to view or to download this ppt file, which is simply a poster presentation prepared a while ago for a conference held in Naples, Italy. Hopefully, it may come closer to you how medical genomics can be related to developing good computational models of therapeutic (or scientific) interest, should you get a moment to have a look at this digital version of the poster presentation. Welcome to In Silico Genesis! This is a snapshot of two adjacent monomers of a pentameric protein called nicotinic Acetyl choline receptor. It is a computational model built on pairwise homology comparison, which was in fact done quite a while ago. 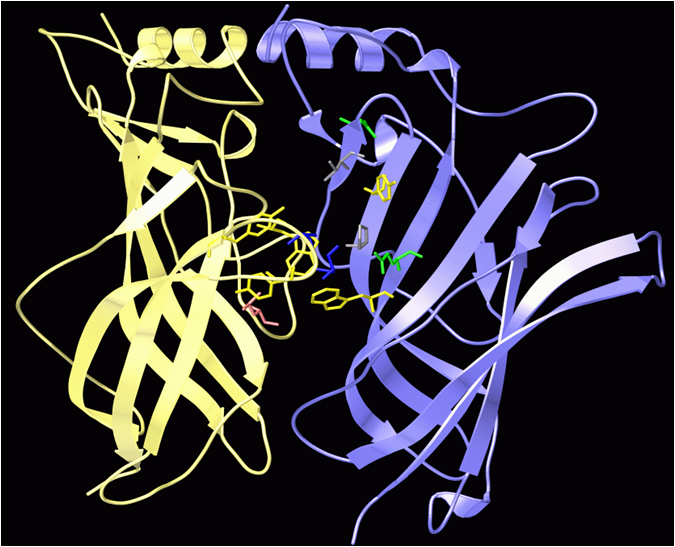 What is shown is part of an N terminal domain connected to its integral membrane protein. In this case, there is a ring-like structure made of five constituent monomer, whilst a drug ( or a small molecule, if you would like) would bind in a pocket formed in between two neighbouring ones. It is helpful for understanding how the small molecules may bind & pass through the gate-keepers on the membrane, in order for them to be delivered into the cells. Homology modelling is relatively straightforward, as long as there is an available 3D structure, readily determined and an identified target (for instance via medical genomics, though there can also be other ways) and a good homology comparison between the two, with some luck and skill.